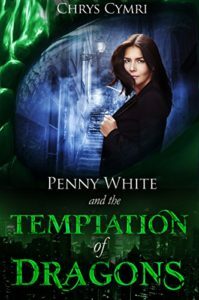 About half way through The Temptation of Dragons (Penny White Book 1) by Chrys Cymri, I thought to myself: “If I loved this book any harder, I’d have to marry it.” Yes, it’s got the sort of catnip that attracts me: talking dragons, a cozy mystery, wise-cracking heroine. But then there’s so very much more. I actually started reading slower just so I could savor the story for as long as possible. It is at once light-hearted and dark, easy-going story-telling, but with complex real-world themes. The things that put this book over the top are the characterizations and deeply thought-out world-building of both Lloegyr and England, mixed with the daily problems of a church official, and still-in-grieving woman who is suddenly confronted with the return of her wayward brother. And then there’s the problem of mixed marriages (human/dragon, gryphons/were-fox, etc) and an anti-mixed relations group, and how the other land is leaking over into England (does every government and church official know about Lloegyr and the thin places?). 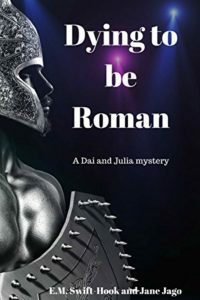 Dying to Be Roman: A Dai and Julia Mystery by Jane Jago and E.M. Swift-Hook is remarkable in its blending of two genres: alternate history and mystery. Imagine if Roman had never fallen, and technology had advanced as rapidly as it had been in the golden age of Rome. You might have a “Londinium” such as one finds in this book—where society is strictly stratified, justice can still be carried out in the coliseum, but crime is still crime. Enter Dai—a hardworking investigator and native of Brittania (who are treated as lower class). When a murder of an elite athlete of the Games, Dai must investigate quickly. But then he’s assigned the Roman inquisitor Julia, and his world is turned upside down—both personally and professionally.